Under the beautifully decorated tree lay an intriguing package. Lucy thought it might just be what she had been hoping and praying for. It was one of the last presents to be opened. In Lucy’s family Christmas was ruled by several traditions, one was that everyone had to take it in turns to open presents and the smallest ones were handed out first. Lucy waited until the very last present came to be handed out. It was for her. Could it be…? Yes it was, her very own laptop computer! Wow! Now she would be able to chat to her friends on Facebook and Bebo and send emails to her cousins in Australia. Lucy was in a daze thinking about all the things she could do on her new computer. Lucy’s parents were not very interested in computers themselves, so Lucy’s cousin Jack set it up for her. He put the antivirus software onto it and checked that her programmes were all ready for use. After Christmas dinner Lucy took the laptop to her room. The others were all either dozing in front of the TV or playing with their new toys. Lucy was the eldest child in her family and her parents were careful to give her some space and time for herself as it would have been too easy to keep asking her to look after the baby or the twins who were four years her junior. Lucy made herself a Facebook page and wondered which of her class mates she could ‘speak to’. Her two best friends were not on Facebook. Lucy suddenly realised that although she had wanted very much to be able to go online to contact friends, the people who talked about it most were not exactly her friends. They were a group of girls in her class who always talked very loudly and who wore their school uniforms in ways which made them look as if they were not uniforms at all. Their clothes were shorter and tighter than other girl’s clothes. Lucy’s mother had said they were common girls and that Lucy should stay away from them. Tap tap tap, Lucy typed the name of the loudest, commonest girl onto the keyboard. Ping. There she was on the screen, looking five years older than her twelve years, fully made up and pouting for the camera. Lucy looked at the messages on her ‘wall’. They were about parties and barbeques on the beach that she and her friends had been to. Lucy’s heart yearned to become part of that exciting life. Lucy shut her computer. She wasn’t sure what to think what to think. She was not sure whether to reply as she didn’t think it was a friendly message. The next day there were three messages from boys who were asking if they could be her friends. Lucy knew their names. Two of them were in the year above Lucy at school and one she wasn’t sure if she knew, but his photo was nice, he looked very ‘cool’. Lucy agreed to befriend the boys. She began to spend quite a lot of time on her computer looking at pop groups and listening to music. Every day there would be messages from the boys. Sometimes they made her laugh and sometimes she didn’t understand them. It was as if they were speaking a different language. Her English teacher would never have approved of their writing. If a word could be shortened they would shorten it so that sometimes their messages seemed like nonsense. However Lucy loved to think that there was someone out there in the world who thought that she was worth ‘talking to’. When school started back after Christmas Lucy thought the boys would speak to her in the corridors, but it was as if she didn’t exist outside the computer. They all ignored her completely; so did Trina. Lucy felt upset. She decided to ask the very cool looking boy, Jason, why he would not speak to her in school. She posed the question on Facebook. Although she had only sent the message to him all three boys replied. Lucy felt dreadful. How could anyone be so unkind and for no reason? How could she face their icy stares in school? Why would anyone do such a thing? Lucy’s mother noticed that she was looking pale and worried and asked her what was the problem. ‘CYBER-BULLYING IN SCHOOLS’ said the headline. Lucy went pale, tears welled up in her eyes, and then the story came out. ‘I had no idea about this sort of thing,’ said Lucy’s Mum. ‘What a nasty crew, ‘said Lucy’s dad. ‘People like that are best ignored. They are worth nothing to you. People who get pleasure out of being unkind to others will soon find they have no friends at all. You wouldn’t want them as friends in real life, Lucy, so just leave them be. Hold your head up. You have done nothing wrong. Just forget about them. I’ll have a word with the head teacher just to say this has happened. I won’t ask him to say anything to those boys, but to the whole school. You tell me if they try to upset you again. Meanwhile give that Facebook a miss, or check your settings so that only real friends can contact you. Have you experienced either receiving hurtful messages or even sending them? What effect did those messages have? 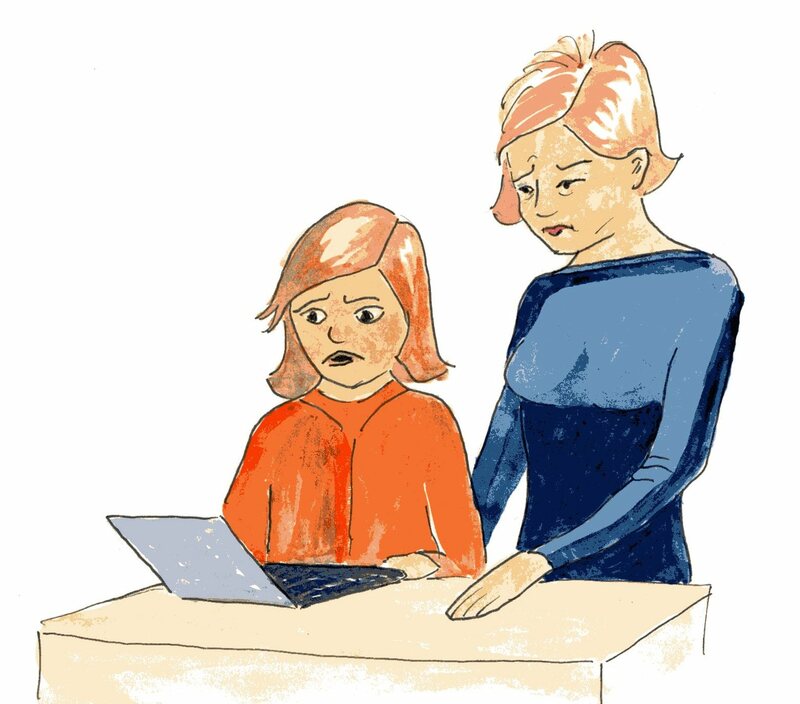 Did you know there are good useful explanations about what to do about cyberbullying online? this cyberbullying is disgusting and should stop now! You are right Beth. It is disgusting when people do things to other people that they would hate if someone did it to them. Wise people would never do that. Thanks you Tom. It makes the bully look very bad indeed. They think they are unknown, but in their hearts they have done wrong and I hope they will come to realise this.